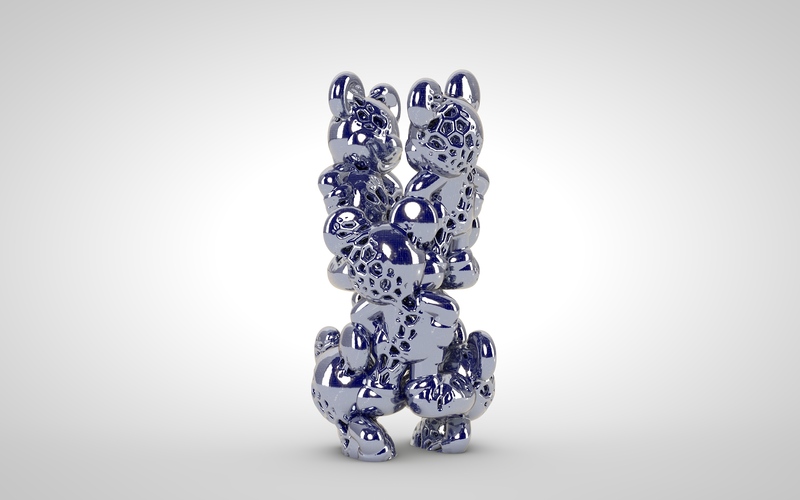 Algorithmically generated 3D printed sculpture series mimicking biological and genetic modification based processes. Mutations are the driving force of evolution. In 2010 a team of researchers at the University of Osaka created the animal in their “Evolved Mouse Project,” in which they use genetically modified mice that are prone to miscopying DNA and thus to mutations. Their main achievement was the production of a mouse that tweets like a bird. The “singing mouse” was born by chance but that the trait will be passed on to future generations. 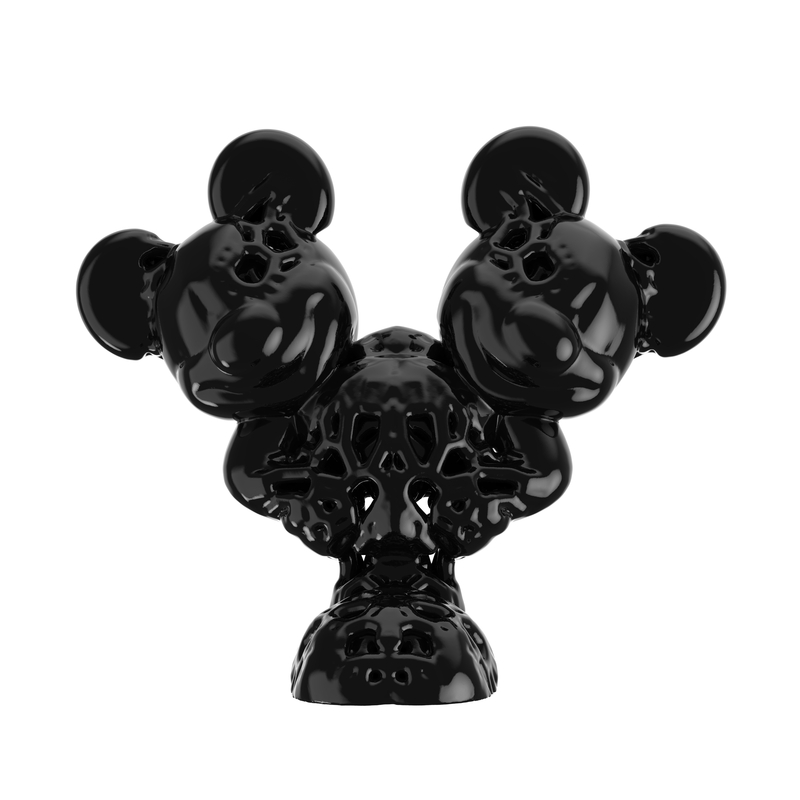 For the “Mickey Morph” series De Wilde was inspired by the concept -and devotion of the scientists- to create a living Mickey Mouse. Instead of switching off genes, De Wilde switched of polygons in the 3d geometry. The results are ‘mutations’ with an organic feel. De Wilde is currently discussing a art and science crossover project with the Uchimura and the Kokoro biology group in Osaka, Japan. 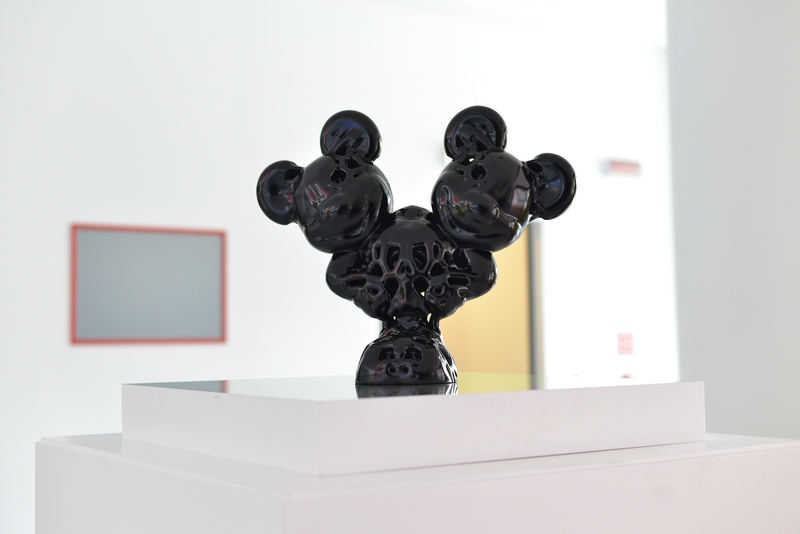 Mickey Morph – The relationship between nature, technology and cultural diversity. Disneyfication, such as economic globalization, tends to ruthlessly replace local variants, products, etc. Baseball hats, blue jeans and sneakers become the uniform of teenagers in both Budapest and Bangalore while Western TV shows promote the illusion of unlimited wealth. This process is not the same as the different artistic traditions that teach each other and freely exchange ideas. Cross-pollination with, and borrowing from, other cultures has enriched both Western and Third World arts (e.g. Gauguin in Tahiti). (Old) Business culture is different: the guiding principles are efficiency and profit, and there is a tendency to roll both diversity and authenticity, and becomes therefore, a self-centered culture, a monoculture. Art, on the other hand, essentially flourishes through contact with the outside world. The concept, in a nutshell, is that hybridity and mutation are forms of change with particular relevance to post-modern culture; A form of deconstruction. Without wishing to expire in an overly simplistic view, this could also be said of art, because “lending” of form(s) and manipulation thereof is an integral part of the concept of rendering (mimesis) of a Likeness. In this way even the most accurate portrait in a particular form is a variation of ‘the original’. These “mutations” also provide an excellent opportunity to investigate Disneyfication from different perspectives, to question and even condemn. Often, the legal (waterproof) framework around Disneyfication leaves little margin for developing a culture of shared and authentic experiences based on mass-oriented cultural references, if you can or can not generate new meanings by law. 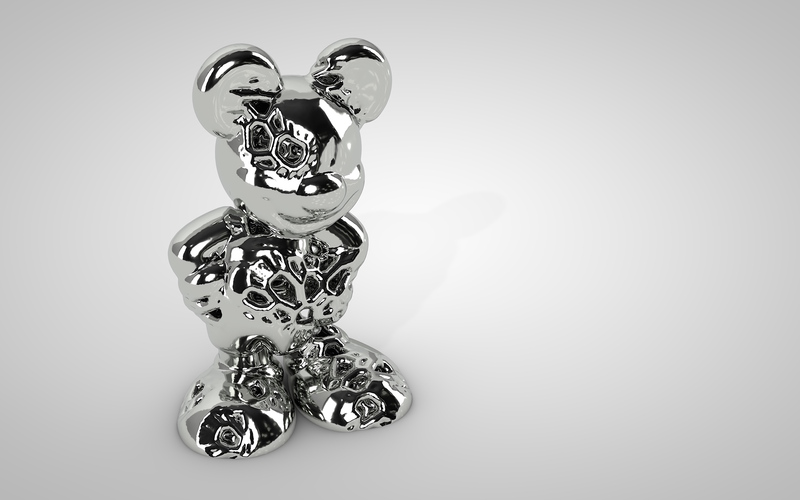 From this point of view, Mickey Morph_ “Death of Diversity” questions copyright laws. 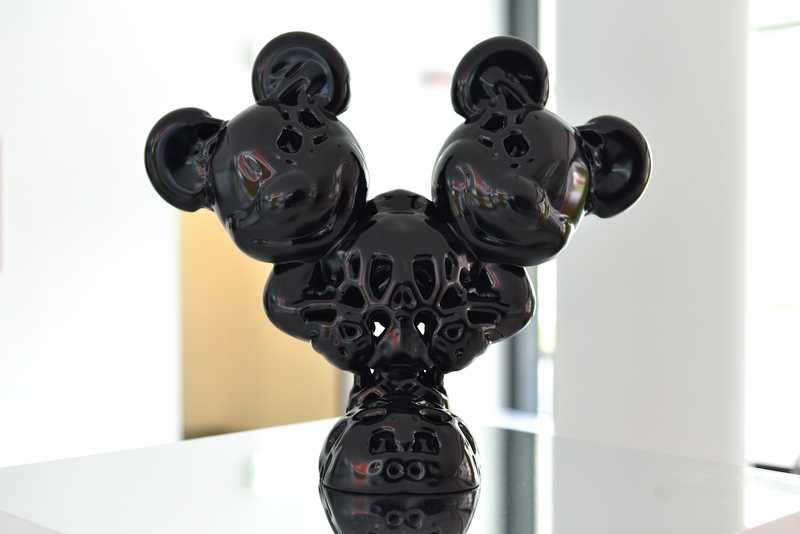 What Mickey Morph_ “Ch1m @ era” (bioart sculpture) wishes to present is specific: art that explores transmutation, investigates drastic change in shape and changes beyond the boundary of ‘natural’ evolution, but ’makeable’ or altered evolution. Thanks to computer technologies, software and hardware (eg 3D printing of biomaterials), we can generate and print them (e.g. organic materials), and who knows to create new types in the lab. That’s also Fairness; the right to copy and recombine, the right to experiment, the right as an artist to fully enjoy the freedom of creation – and to fully exploit it. But Mickey Morph also refers to the -sometimes- necessary testing on animals, to the animal suffering in the laboratories, to the legal framework around it, the ethical awareness supported by many scientists to do something about it. That is Mickey Morph’s dream: At the intersection of art and science mapping these ethical questions, experiments and to transform and mutate them into something that confronts us with ourselves and the society were living and and evolving into. * A chimaera in biology is a mixture of two species – either as living organisms or cellular artifacts – when paleontologists accidentally combine the remains of different species.